I have taken several flights from Emirates, FlyDubai and Saudi Airlines. Why is it announced to put your own mask on before helping others with their mask. I wouldn't do it if I am travelling with my family. I would like to help them first. So what's the reason? It's actually quite simple. The reason they do this is to make sure you are able to help others. What do I mean by this? During an emergency where the air in the plane is thinning, it is important that you are able to breathe. You can become light headed and if you are trying to help someone put their mask on and you are becoming dizzy, it isn't as effective if you are able to think clearly in the situation. Think about it this way, imagine you and a friend have been shot in the leg. If you are in agony and can't think clearly, how much do you think you can help your friend? Now imagine you have stopped the bleeding on your own leg and bandaged it. You are now much more capable of providing aid to your friend. The same applies here. If you are sitting next to your family and becoming dizzy, disoriented, and fumbling with your child's mask, you are not just harming yourself to save the child, but also not giving the best aid possible. It is much better to put your own mask on, remain calm, think clearly, and provide aid to your family so that neither are hindered. First of all you should know that in a commercial passenger flight the oxygen masks contain enough oxygen only for 12 minutes and after that everyone on board will go unconscious due to Hypoxia (oxygen deprivation). If the flight is at an higher altitude like 20,000 ft. or above, within 20 to 60 seconds one can get unconscious. This is the main reason flight attendants always advise you to put the oxygen masks first and then assist your children or other passengers – in case of an emergency. If you're travelling with someone who requires assistance, you need to remain conscious in order to assist them, especially if you have multiple people with you, say two children. Hypoxia can hit in as little as 5-10 seconds and without special training, you can't fight it. So, you need to keep yourself conscious first, then assist others. Even if someone passes out due to hypoxia, they will almost always regain consciousness once oxygen is restored. You are very unlikely to suffer from a few seconds of hypoxia (hypoxia at birth or long-term exposure are different matters). In case of depressurization (and if nothing else is wrong! ), the crew will bring the aircraft down to an altitude where the air is breathable. Even if you fell unconscious in the meantime, you would almost certainly recover with little or no long-term sequel. The main danger is completely different: Mood, perception and cognition are impaired. You quickly become unable to act coherently but you won't notice it. You simply become euphoric, can't control your movements precisely (e.g. during exercises in an hypobaric chamber, the participants' writing becomes gibberish) but do not even realize it. Consequently, if you start by helping your children, you won't feel when the time to put your mask is coming and you might very well fail to put anyone's mask on. But if you put your mask first, your children are in no real danger and you will be best able to help them. Incidentally and in line with what I wrote above, the oxygen masks are not there to save you from the hypoxia itself, it's to make sure everybody stays as calm as possible and prepares themselves for what's coming next (and possibly because many people would otherwise be afraid of the very idea of flying at an altitude where you cannot breathe). Passengers only have a few minutes of oxygen but pilots have a completely different system with at least 15 min of reserve. That's because it's a lot more important that they be able to stay conscious and alert and they could theoretically still save everybody's life even if you had no oxygen masks in the cabin. But mostly, let's talk about those lungs. The simple answer (that you put the mask on yourself so that you survive long enough to help your child) feels... really hard to swallow. Any parent can all hold their breath long enough to replace a diaper. A mask cannot take longer than that. The danger they claim seems just... improbable. Total lung capacity (TLC) in a healthy adult male is about six liters. There's always 1.2 liters of air in his lungs - he physically cannot breathe out more than that. You cannot empty your lungs. If he could, the sticky wet tissues of his lungs would stick together and he may be unable to breathe in again. This is called the Residual Volume (RV). There's a certain amount that he can force out if he must, below his normal "breathe in and out" cycle. This Expiratory Reserve Volume (ERV) is about 1.2 liters. 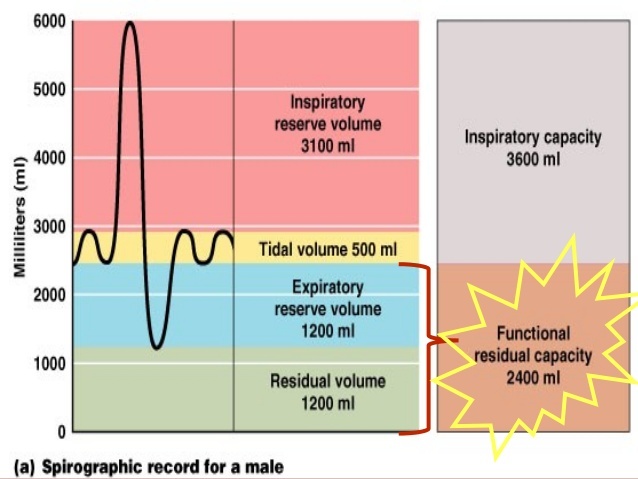 When breathing normally, he breathes in and out by about 0.5 liters each cycle. This is called the Tidal Volume (TV). He can, if he must, breathe in an additional 3.1 liters on top of that. There's also a little bit of air in his air passages, outside his lungs sealable inside by closing his mouth, which is about 0.2 liters or less when breathing normally. Now let's talk about pressure, the other half of Boyle's Law. On the ground, around sea level, air pressure is around 15psi. Say our average healthy man is sitting in a plane, with a pressurized cabin. While pressurized, the passenger cabin is typically only about 10psi. That's like normal air pressure at about 8,000ft. However, the plane suffers an explosive decompression event at its legal flight ceiling of 45,000 feet, and air pressure in the cabin drops further to about 2 psi within the blink of an eye - he has no time to react. It's a couple of seconds before he's even realized what's happening, at which point he gets smacked on the head by his air mask. Even though he reads Quora, and has read this thread, clamping his mouth and nose shut will not have been his first instincts in those valuable first moments. Instead, it's natural and instinctive for him to gasp, to pull in that additional three liters of air, nearly doubling the air volume in his lungs. Normally, this would help him survive. But, when he was breathing normally, idly perusing the safety card, the air in his lungs was fluctuating between 2.5 and 3 liters. By opening his mouth at 2 psi, and doubling the air in his lungs, he reduced his available oxygen. Air rushed out. He went from three liters at 10psi, to six liters at 2 psi. Six liters at 2psi is the same as 1.2 liters at 10psi: that's only 40% of the air he had before breathing in! Put another way, if he'd breathed out as much as he possibly could before the decompression, then closed his mouth and relied just on the RV air he'd been unable to breathe out, he'd be no worse off. But it's worse than that, really. Because that's same as 0.8 liters at sea level. That's less air than he has ever had in his lungs in his life. EXCEPT... it's even worse than that. Because, he won't do that. He won't grab that lungful of air. Because there's no CO2 shortage telling him he needs to get more air. He's breathing normally. His lungs aren't extended to six liters. They're only extended to the normal 3 liters (equivalent to 0.4 liters). He's breathing normally, so only half a liter per breath (equivalent to about 70 ml). And remember, he's an average fit, healthy adult male. Unhealthy or unfit? Female? Young, Old? Smaller than average? Your lungs will be smaller. Maybe much smaller. Now let's change tack completely, and instead talk about freediving. @Johns-305 pointed out that the world freediving record was eleven minutes, which is totally plenty of time to help everyone around you, and still have a quick coffee break. and a big lungful of air taken at about 15psi. Ignoring all factors but the last, consider that freediver Herbert Nitsch is reported to have a lung capacity of 14 liters (not sure if this is with or without packing). A trained, prepared professional with 14 liters of air in his lungs and plenty more hyperoxygenated into in his blood, can last 11 minutes, max, before blacking out. What does this mean for our healthy but untrained and unprepared adult male, with his equivalent of 0.4 liters, plus 0.07 every breath? He blacks out in less than 20 seconds. Smarter Everyday did a video on the subject. It doesn't add much to the other answers, but it's fun to see what actually happens when you lack oxygen. The key concept here is time of useful consciousness: how long you can take meaningful actions in a low-oxygen environment. At 35,000 feet (the typical altitude for a long-distance flight), that's about 30 seconds. If you help someone else put on their mask first, you probably won't have enough time left to put on your own. This question on Aviation.SE and the linked video of training in a hypobaric chamber cover what happens in a hypoxic situation. And if you're worried about your kids, notice that the test subject in that video recovers almost instantly once his mask is back on. A short answer to tell others (not 100% accurate, but right in principle): It takes 30 seconds until you pass out without mask. It takes two minutes until you die without mask. If you try to put a mask on your children first, you pass out and two minutes later you all die. If you put your own mask on first, your children will pass out, but you have plenty of time to put their masks on and no real harm is done. It is better for your children to put your own mask on first. It is easier to help someone else while conscious. It's just a simple medical fact: if you lack of oxygen and you have a fast pressure decrease around you - you will loose some air from your lungs to equal the pressure. And you will fall unconcious very quickly - even in about of a tens of seconds. So - to be "online" - you need to put your mask on and provide some oxygen to yourself very first hand. No, it's not a selfish act even if you need to help someone near: helping means physical and brain activity that will drain your oxygen level even faster, you won't be able to help them if you won't put your mask on. Even if they will fall unconcious - there still some minutes for you to put their masks on their faces. The reason is that you need to be safe and as healthy as possible in order to help others. If there is a real danger of getting out of air und you begin to lose consciousness, you won't be able to help your family either. There is a general principal in medicine -- first of all, do no harm. This extends to lifesaving practice in that you should, while attempting to help others, not put anyone else at risk including yourself. All of these items and more can put the potential rescuer and others into danger. When you are given directions for lifesaving procedures by authorized personnel, it is pretty safe to assume that they are providing expert advice, though it is sometimes calculated to be the best advice for the least strong, capable or experienced person likely to be in the situation that it covers, it is likely to be the best advice for you. In a plane, follow the directions of the trained personnel to exit the craft, pay attention to the marked emergency exits, use your seat as a flotation device, take your high heels off before jumping into the emergency exit ramp, and put your mask on first before assisting others! It makes sense when you think about it long enough, but you won't have the time to think about such things in the event! Not the answer you're looking for? Browse other questions tagged air-travel safety airlines or ask your own question. Airport security compatible container for small amounts of alcoholic spirits (drinks)? Why do airlines prohibit having two infants in the same row? Why do flight attendants still give safety instructions if the plane has screens installed in all seats? Being a tourist, can I film police in the US? Has the flight security briefing text changed? Can I get cheaper flights if I've flown before with United? How do we connect in Cyprus to our flight with Emirates?